"Hi," read the email sent to Kari Bagnall, out of the blue. "I came across ur website and wanted to find out if you take in monkeys." The email's sender - identified simply as "D" - told Bagnall she had recently come across a pet carrier dumped by the side of a highway. 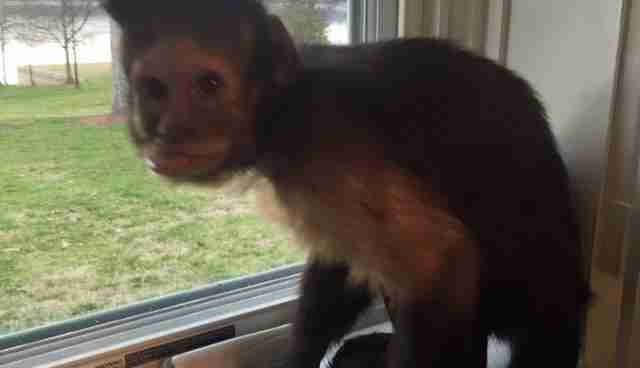 She checked inside and found a young capuchin monkey who was missing all his teeth and also a good portion of his fur. He "was very frightened and bleeding everywhere," read the email. "I don't want to put him somewhere where they will just put him to sleep." Bagnall was the right person to contact, as the founder of Jungle Friends Primate Sanctuary, a Florida organization that does take in monkeys (though she would prefer more states to ban the keeping of pet monkeys, so there'd be fewer to take in). 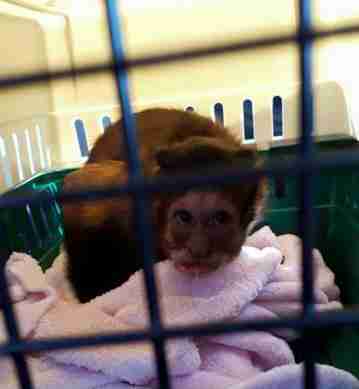 Jungle Friends is currently home to 302 monkeys, who arrived in a variety of grim ways. Some were abandoned at the sanctuary's gate, while others were former pets or performers. One group of monkeys had been retired from laboratory research after being used to test cocaine and ecstasy, among other things. 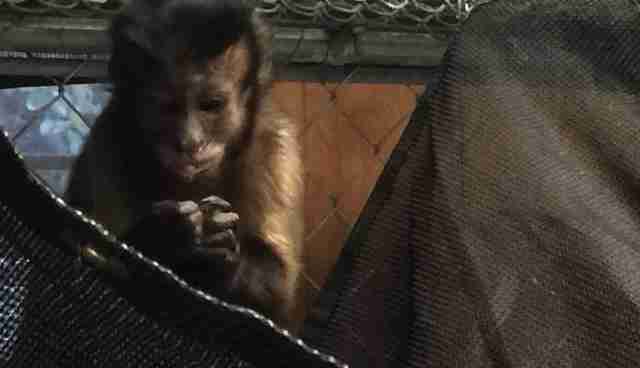 "A number of monkeys were found running loose from a variety of places," Bagnall told The Dodo, "from running down the Eisenhower Expressway in Chicago to the Louisiana Bayou." The monkey found in the pet carrier isn't the first to come to Jungle Friends toothless either, since removing teeth is a cruel but standard practice for monkeys used as pets, for entertainment and even as so-called helper monkeys. But this one's still unusual. "This is the first rest stop monkey," Bagnall said. 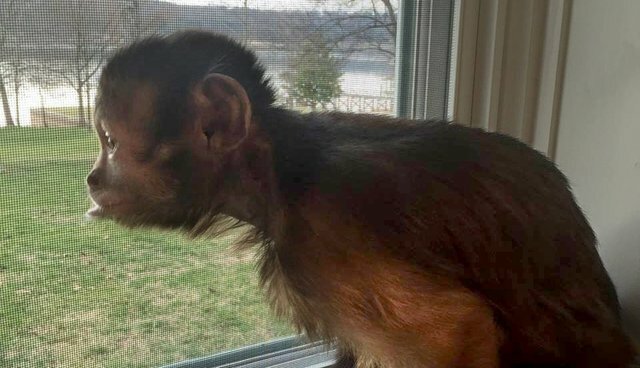 All that can be said confidently, based on how skinny and terrified he seemed, was that "his contact with humans wasn't always positive," April Truitt, of the Kentucky-based Primate Rescue Center, told The Dodo. "I wish he could tell us." Truitt helps transport monkeys from places where they aren't safe to the Primate Rescue Center and a handful of other reputable sanctuaries around the country, like Jungle Friends. "My specialty is getting animals from point A to point B," said Truitt. Bagnall asked Truitt for help getting the rest stop monkey to Florida. So Truitt called upon her network - involving several drivers and a volunteer pilot - who transported the monkey over the course of a couple of days. Along the way, the monkey was named Mongo (after a complicated character from the movie "Blazing Saddles"). He also received reassurance that whatever sad, mysterious circumstances got him to Jungle Friends could be left behind. Mongo arrived at the sanctuary early this week. His health - rather miraculously - seems good. And he now seems happy, according to Bagnall. Between the great food and the sunshine, not to mention his new comfortable environment, Mongo's coat is already growing in soft and thick, and "he is much more calm," Bagnall said. "He is like a different monkey." Mongo is in his own enclosure now, within chatting distance of four capuchin "bachelorettes." He seems to have taken a real shining to one capuchin named April, and she to him. April's former owner used to charge money for her to sit on people's shoulders at circuses and carnivals. Both April and the owner retired a few years ago, so April was brought to Jungle Friends. Bagnall thinks this match might just work out. April and Mongo are both extremely sweet, and are always making eyes at each other. Plus, they've got something else in common: "April doesn't have any teeth, either," Bagnall said. To learn more about Jungle Friends Primate Sanctuary, go here.